About a month ago we spotted two new entries in the country availability listings for the new Chromecast and Chromecast Audio: Taiwan and India. Today both of those are coming true (though India is somewhat conditional - see below), and you can add Hong Kong into the mix. For both Hong Kong and Taiwan, the streaming gadgets are now available on their respective Google Stores. The Chromecast 2015 and Chromecast Audio are HK$349 (around $45 USD) in Hong Kong and NT$1445 ($44.75) in Taiwan. In India, things are a little more complicated. The new Chromecast and Chromecast Audio aren't available directly from the Google Store. Instead, the store links to a collection of well-known Indian retailers: Flipkart, SnapDeal, PayTM, Reliance Digital, and Croma. The last two don't seem to have a listing at the moment, but Flipkart, SnapDeal, and PayTM are all selling both gadgets for Rs 3399 (about $51). It's possible that the retail-first approach is due to some kind of obligation on Google's part, or simply because Google's Indian infrastructure isn't up to the task of distributing a huge amount of cheap streaming gadgets. At this point the new Chromecasts are available in 24 different countries. 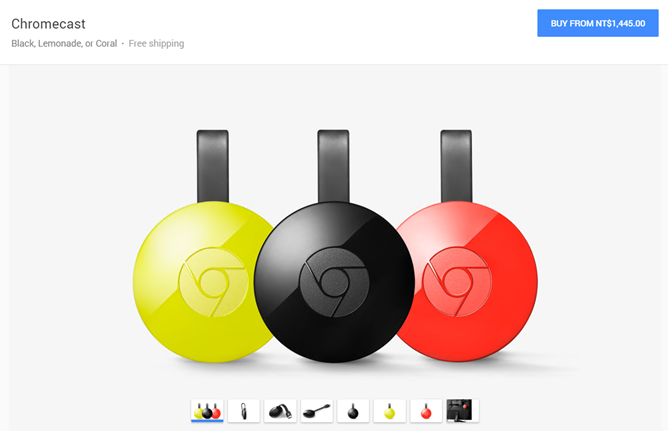 According to Google's availability page, the original model is only being sold (at least directly) in Malaysia.